What is the secret to produce so tasty products? 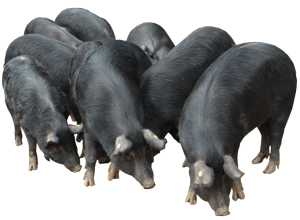 The meat processing of Nebrodi Black Pig is the step which really makes the difference. Our raw material is the secret, but that is not all. There are other things such as expert hands and techniques which makes ours products of excellence. Nebrodi Black has the aim to satisfy sophisticated customers who are fascinated by the research of local feature in products and typicalness which now are quite disappearing. Our products are collocated in a business niche which rewards quality, excellence and authenticity. Now get relaxed, we are going to make a trip together among the stages which bring to the production of our Salumi. Slaughtering, Sectioning, Elaboration and Seasoning, these are our four manufacturing stages. Each of this happens in local establishments which the Nebrodi Black Pig Control Organism approves. We stuff our salamis in natural bowels. We trim our hams. We knead our sausages. We collect by hand our wild fennel. We select and mix the spices to aromatize our products. We establish the seasoning time because no product can avoid our strict smell check. These are not simple gestures but they are the proof of how much we take care of the product we are manufacturing. So, what are we proposing you? We are surely offering you our work combined with the experience and the mastery of our artisans.